I create a range of beautiful mirrors decorated with stained glass borders, which can be single or double.The solder finish can be either shiny silver or black patina following by a black polish for a glossy effect. All mirrors come complete with hanging fixings. Examples of my mirrors can be seen below. My standard sizes are 8 x 12, 8 x 10 or 8 x 14 (inches), however bespoke sizes can be created on request. This photo simply does not do justice to the beautiful red glass ! A mirror with a border of luxurious translucent red glass. Finished in a shiny silver solder. Measurements are 8 x 12 inches. This mirror has a border of coloured Antique Cathedral glass panels. Finished in a shiny silver solder. A circular mirror with a border of glass in the colours of the rainbow spectrum. Finished in a shiny silver solder. Diameter is 10 1/2 inches. This mirror has a border of blue and white wispy glass, and is finished in a shiny silver solder. Available in customer's choice of colour. 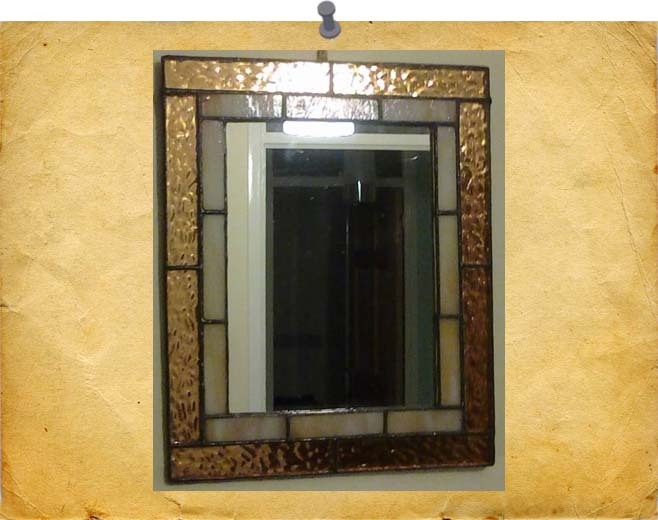 This has an English Muffle medium amber glass as the outer border and a complimentary amber and white wispy glass for the inner border. Available in customer's choice of colours.